Obstructive sleep apnea (OSA) is characterized by repetitive cessation of airflow during sleep due to upper airway collapse, resulting in intermittent hypoxia and sleep fragmentation . OSA is a common condition with a prevalence ranging between 5% and 15% among adults . Clinical manifestations include loud snoring and breathing pauses during sleep along with excessive daytime sleepiness and cognitive impairment . The diagnostic standard is overnight polysomnography, and the mainstay of treatment is continuous positive airway pressure (CPAP) application. Cumulative evidence suggests an association between OSA and cardiovascular disease (CVD) [3, 4]. The incidence of OSA in patients with CVD is estimated between 30% and 50% . This is attributed to the intermittent hypoxia accompanying apneic events during sleep, the arousals caused by upper airway obstruction and the sleep fragmentation, the repeated sympathetic activation and the development of negative intrathoracic pressures, all of which may induce the activation of neural, humoral, metabolic and inflammatory responses and promote vascular injury [6-8]. Adherence to CPAP treatment reduces the risk of CVD in OSA . Vascular Endothelial Growth Factor (VEGF) is a cytokine stimulating normal and abnormal angiogenesis . Its expression is regulated by hypoxia-inducible factor that is activated in hypoxic cells . Previous studies have highlighted the role of VEGF in the development and progression of CVD . VEGF expression has been shown to increase in both airway epithelial cells and bronchial smooth muscle cells after exposure to intermittent hypoxia for 24 h . Furthermore, increased expression of VEGF has been reported in the liver and lungs of mice exposed to intermittent hypoxia for 35 days . Several studies have demonstrated increased serum levels of VEGF in OSA, patients [15, 16]. Insulin-like Growth Factor Binding Protein-3 (IGFBP-3) is the most abundant insulin-like growth factor in the serum . Its circulating levels strongly relate to diurnal growth hormone secretion and may reflect spontaneous growth hormone secretion in healthy individuals . Decreased serum levels of IGFBP-3 have been associated with increased risk of CVD, including coronary artery disease and CVD mortality [19, 20]. In children with OSA, serum levels of IGFBP-3 may be decreased and be associated with growth retardation, while no association of this protein with OSA has been shown in the elderly [21, 22]. The aim of the study was to measure the serum levels of VEGF and IGFBP-3 in OSA patients and compare them with those of control subjects, to explore associations with anthropometric and sleep parameters and to study the effect of CPAP treatment on these levels. A total of 163 patients (141 males and 22 females), referred with symptoms suggesting sleep-related breathing disorders, were prospectively enrolled. The study protocol was approved by the institutional ethics committee and all participants provided their informed consent. Exclusion criteria at baseline included smoking, known history of CVD, dyslipidemia, diabetes mellitus, allergic, pulmonary or hematological disease, malignancy, recent injury or surgery, current infection or any systemic medication use (e.g. hypolipidemic or anti-platelet agents). During the study, additional exclusion criteria included significant change in body mass index (BMI) (defined as an increase/decrease > 5% compared with baseline measurement), new diagnosis of a chronic disease, initiation of systemic medication use, or surgery. Patients with poor adherence to CPAP treatment (defined as use < 4 h/night) were also excluded. Medical history, current medication, tobacco smoking and alcohol consumption at baseline were recorded. All patients underwent clinical examination. For each patient anthropometric characteristics were measured. During examination, subjects were lightly clothed and without shoes. Height and weight were measured to the nearest cm and Kg, respectively. BMI was calculated using the formula: BMI = weight (kg)/height2 (m). Hip, waist and neck circumferences were measured using a standardized protocol . As part of the routine clinical evaluation to exclude pulmonary and CVD, pulmonary function tests, chest radiograph, arterial blood gas analysis, blood pressure measurement and a resting 12-lead electrocardiogram were performed. All subjects underwent an attended overnight PSG (Alice® 4, Philips Respironics, Murrysville, PA, USA) from 22:00 to 06:00 hours. A standard montage of electroencephalogram, electroocculogram, electromyogram and electrocardiogram signals together with pulse oximetry and airflow (detected using combined oronasal thermistors) was used. Thoracic cage and abdominal motion were detected by inductive plethysmography. Apneas, hypopneas and electroencephalogram recordings were visually evaluated and manually scored using standard criteria . Apnea was defined as complete cessation of airflow for ≥10 s. Hypopnea was defined as 50% reduction in airflow ≥10 s accompanied by ≥4% desaturation or by an arousal recorded on the electroencephalogram. Apnea-hypopnea index (AHI) was established by the number of apneas and hypopneas per hour of PSG-recorded sleep time . Oxygen desaturation index (ODI) was defined as the number of oxyhemoglobin desaturations of at least 3% per hour of PSG-recorded sleep time . OSA was graded as mild (AHI: 5-15/h), moderate (AHI: 15-30/h) and severe (AHI >30/h) . Patients with purely central apneas were excluded. Patients with OSA who accepted CPAP treatment, underwent a second sleep study for CPAP titration. Optimum CPAP pressure was defined as the pressure value that abolished all respiratory events during sleep, arousals and desaturation episodes. All OSA patients who initially accepted CPAP treatment were scheduled for follow-up visits at 1, 3 and 6 months after initiation of CPAP treatment. At the 6-month follow-up, information regarding recent medical history was updated, patients underwent physical examination and BMI was re-calculated. Adherence to CPAP therapy was evaluated by dividing total recorded hours in the device timer by the number of nights of use between treatment initiation and follow-up examination. Patients were classified, according to CPAP use, as good compliers (≥4 h use per night) and poor compliers (<4 h use per night), who were excluded from the study. At baseline, blood samples were collected from each patient after 12 h overnight fasting on the morning after the completion of PSG. Blood was collected from an antecubital vein, was immediately centrifuged for 10 min at 3000 rpm and the supernatant was then stored in a refrigerator at -80°C until analysis. VEGF and IGFBP-3 serum concentrations were measured by an ELISA test using a commercially available kit (R&D Systems, Minneapolis, USA) according to manufacturer’s specifications. At 6 months, the patients fulfilling the inclusion criteria provided new blood samples during a scheduled morning appointment. Analysis was carried out with version 17.0 of the IBM Statistical Package for Social Sciences (SPSS). Continuous variables were tested for normality of distribution by the Kolmogorov-Smirnov test. Values are expressed as mean ± standard deviation (SD) or median (range) for variables with or without normal distribution, respectively. Correlations were analyzed with Pearson's correlation coefficient, while comparisons between means were explored with the Student's t-test. The effect of CPAP on examined parameters was studied by paired t-test. Two-tailed significance was defined at p<0.05. After initial assessment, a total of 96 subjects (87 males and 9 females) were included in the study. A flow chart of the study procedure is shown in Fig. (1). After PSG, subjects were divided in two groups: OSA group (defined as AHI >15/h) including 65 patients (60 males and 5 females) and control group (AHI<5/h) including 31 subjects (27 males and 4 females). The two groups did not differ significantly in terms of age or BMI. Correlation between apnea-hypopnea index (AHI) and Vascular Endothelial Growth Factor (VEGF) levels. Comparison between Vascular Endothelial Growth Factor (VEGF) (3a) and Insulin-like Growth Factor Binding Protein-3 (IGFBP- 3) levels (3b) of controls and obstructive sleep apnea (OSA) patients at baseline and at 6 month follow-up. Bars represent the interquartile range (i.e. middle 50% of the observed values), while the upper and lower whisker represent the higher and the lower observed value, respectively. Anthropometric and sleep characteristics of OSA patients and controls. Abbreviations: AHI apnea-hypopnea index; aver SpO2 average oxyhemoglobin saturation during sleep; BMI body mass index; ODI oxygen desaturation index; OSA obstructive sleep apnea; min SpO2 minimum oxyhemoglobin saturation during sleep. As expected, OSA patients exhibited significantly higher AHI and ODI, and significantly lower average oxyhemoglobin saturation (average SpO2) and minimum oxyhemoglobin saturation (minimum SpO2) during sleep, compared with controls. Anthropometric and sleep characteristics of OSA patients and controls are shown in Table 1. At baseline, VEGF serum levels were significantly higher in OSA patients compared with controls (398.4 ± 229 vs. 229.9 ± 149.8 pg/ml, respectively, p<0.001), while IGFBP-3 levels were significantly lower (1.41 ± 0.56 vs. 1.61 ± 0.38 μg/ml, respectively, p=0.039). Additionally, the two groups had similar full blood counts. In OSA patients, VEGF serum concentrations positively correlated with values of AHI (r=0.336, p=0.001) and ODI (r=0.282, p=0.007), while no correlation with average SpO2 and minimum SpO2 during sleep was observed. 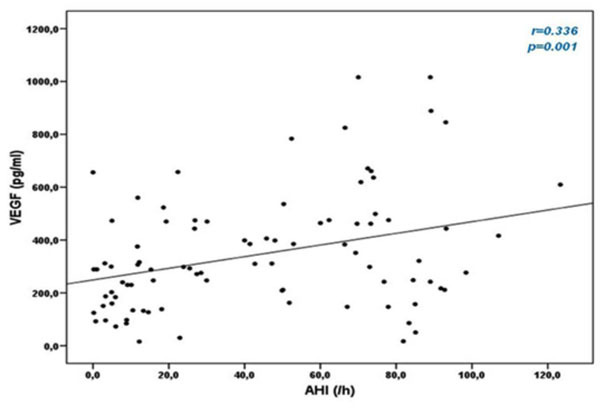 Correlation between VEGF and AHI is shown in Fig. (2). There was no correlation between IGFBP-3 and sleep parameters. After 6 months on adequate CPAP treatment, VEGF levels decreased (p<0.001) and IGFBP-3 levels increased (p<0.001) (Figs. 3a and 3b). Our results suggest an increased CVD risk in OSA patients, as demonstrated by the significantly higher serum VEGF levels and lower IGFBP-3 levels, compared with age- and BMI-matched controls. Moreover, 6 months of CPAP treatment decreased levels of VEGF and increased levels of IGFBP-3. These results agree with previous publications showing increased serum VEGF levels in patients with OSA [15, 16, 26, 27]. In the study of Ma et al. , OSA patients with severe hypoxia exhibited significantly higher serum VEGF levels compared with OSA patients having mild hypoxia and healthy controls. Similar significant differences were found in another study , that compared VEGF circulating levels among 10 OSA patients with severe nighttime hypoxia, 10 OSA patients with moderate hypoxia and 10 healthy volunteers. In OSA patients, serum VEGF levels were positively correlated with both AHI and ODI. Ma et al. have previously shown a positive correlation between VEGF and AHI (r=0.34, p<0.05). In the same study, the degree of nocturnal oxygen desaturation was also correlated with VEGF (r=0.67, p<0.01) . A variety of mechanisms may trigger increased production of VEGF in OSA patients; nocturnal hypoxia seems to be the most important [11, 13, 14]. Additional factors may include enhanced VEGF gene expression by free oxygen radicals and endothelin [28, 29], or lack of the inhibitory effect induced by nitric oxide on VEGF gene expression due to decreased nitric oxide production in OSA patients . Teramoto et al. have reported significantly reduced serum VEGF levels in OSA patients after improvement of nocturnal hypoxia through oxygen administration. Although conditions such as cancer, inflammatory diseases, surgery, trauma may increase VEGF levels [32, 33], in our case both patients and controls were free of comorbidities. It is important to emphasize that 6 months of adherent CPAP treatment decreased VEGF levels indicating an additional beneficial effect of CPAP. Lavie et al. have found significantly reduced VEGF levels after 1 year of nasal CPAP application in 10 OSA patients who complied with treatment, while there was no difference in VEGF levels among non-compliant patients. The authors speculated that decreased VEGF levels could be attributed to the reduction of nocturnal hypoxia via CPAP. Conversely, another group  has reported that 1 week withdrawal from CPAP treatment caused an increase in daytime urinary noradrenaline, reflecting increased sympathetic activity, but this was not accompanied by increased circulating VEGF levels. However, it is not clear whether one week is adequate to provoke a rise in VEGF concentrations, or if a longer period is necessary . We have found decreased IGFBP-3 levels in OSA patients compared with those of controls. These levels were increased after 6 months of CPAP treatment. Our findings concur with those of Nieminen et al. , who compared IGFBP-3 serum levels between 30 children with OSA, 40 children with primary snoring and 35 controls. Circulating levels of IGFBP-3 were significantly decreased in OSA children compared with controls, but there was no difference compared with snorers. In the same study, IGFBP-3 levels significantly increased after adenotonsillectomy in 19 children with OSA. In contrast, in a cross-sectional study of an elderly population (mean age 77 years), there was no significant linear association between OSA and IGFBP-3 levels . Sensitivity analysis, after exclusion of diabetic subjects, revealed that moderate OSA was inversely associated with IGFBP-3 levels in women but not in men . The authors concluded that there is no significant association between sleep-disordered breathing and IGFBP-3 in the elderly population, in contrast to younger individuals . The strengths of the present study are the homogeneous patient population, the absence of comorbidities, and the exclusion of patients not complying with CPAP therapy . A potential methodological limitation is that VEGF levels were measured in serum samples. Indeed, it has been reported that serum concentrations of VEGF are higher than those found in plasma samples because of platelet and leukocyte release of VEGF during blood clotting . However, this limitation applies for both OSA patients and control group and, thus, it may not affect differences between the two groups. Furthermore, Gozal et al. noted a robust linear relationship between VEGF serum and plasma concentrations in OSA patients, suggesting that serum samples could be used in the setting of sleep-disordered breathing when there is no medical condition affecting leukocyte and platelet counts. In conclusion, serum VEGF levels are increased in OSA, while IGFBP-3 levels are lower than controls and 6-months of CPAP treatment resulted in a reduction of the former and an increase of the latter. These results add to the already known uses of VEGF as a marker of hypoxia and disease activity [38-40]. In OSA patients, increased VEGF and decreased IGFBP-3 levels may be added to the novel indexes  denoting increased CVD risk. Finally, our results relating to CPAP use point to an additional beneficial effect of this therapeutic modality , but long-term results in larger patient series are required. Peppard PE, Young T, Barnet JH, Palta M, Hagen EW, Hla KM. Increased prevalence of sleep-disordered breathing in adults Am J Epidemiol 2013; 177(9): 1006-14. Wenner JB, Cheema R, Ayas NT. Clinical manifestations and consequences of obstructive sleep apnea J Cardiopulm Rehabil Prev 2009; 29(2): 76-83. Shah NA, Yaggi HK, Concato J, Mohsenin V. Obstructive sleep apnea as a risk factor for coronary events or cardiovascular death Sleep Breath 2010; 14(2): 131-6. De Torres-Alba F, Gemma D, Armada-Romero E, Rey-Blas JR, Lopez-de-Sa E, Lopez-Sendon JL. Obstructive sleep apnea and coronary artery disease: from pathophysiology to clinical implications 2013. Somers VK, White DP, Amin R, et al. Sleep apnea and cardiovascular disease: an american heart association/american college of cardiology foundation scientific statement from the American Heart Association Council for high blood pressure research professional education committee, council on clinical cardiology, stroke council, and council on cardiovascular nursing. in collaboration with the national heart, lung, and blood institute national center on sleep disorders research (National Institutes of Health) Circulation 2008; 118(10): 1080-111. Kohler M, Stradling JR. Mechanisms of vascular damage in obstructive sleep apnea Nat Rev Cardiol 2010; 7(12): 677-85. Shamsuzzaman AS, Gersh BJ, Somers VK. Obstructive sleep apnea: implications for cardiac and vascular disease JAMA 2003; 290(14): 1906-14. Anandam A, Patil M, Akinnusi M, Jaoude P, El-Solh AA. Cardiovascular mortality in obstructive sleep apnoea treated with continuous positive airway pressure or oral appliance: an observational study Respirology 2013; 18(8): 1184-90. Ferrara N. Molecular and biological properties of vascular endothelial growth factor J Mol Med 1999; 77(7): 527-43. Semenza GL, Agani F, Feldser D, et al. Hypoxia, HIF-1, and the pathophysiology of common human diseases Adv Exp Med Biol 2000; 475: 123-30. Inoue M, Itoh H, Ueda M, et al. Vascular endothelial growth factor (VEGF) expression in human coronary atherosclerotic lesions: possible pathophysiological significance of VEGF in progression of atherosclerosis Circulation 1998; 98(20): 2108-16. Philippe C, Boussadia Y, Prulière-Escabasse V, et al. Airway cell involvement in intermittent hypoxia-induced airway inflammation Sleep Breath 2015; 19(1): 297-306.
 da Rosa DP, Forgiarini LF, Baronio D, Feijo CA, Martinez D, Marroni NP. Simulating sleep apnea by exposure to intermittent hypoxia induces inflammation in the lung and liver 2012. Ma J, Xu Y, Zhang Z, Liu H, Xiong W, Xu S. Serum level of vascular endothelial growth factor in patients with obstructive sleep apnea hypopnea syndrome J Huazhong Univ Sci Technolog Med Sci 2007; 27(2): 157-60. Schulz R, Hummel C, Heinemann S, Seeger W, Grimminger F. Serum levels of vascular endothelial growth factor are elevated in patients with obstructive sleep apnea and severe nighttime hypoxia Am J Respir Crit Care Med 2002; 165(1): 67-70. Phillips LS, Pao CI, Villafuerte BC. Molecular regulation of insulin-like growth factor-I and its principal binding protein, IGFBP-3 Prog Nucleic Acid Res Mol Biol 1998; 60: 195-265. Blum WF, Albertsson-Wikland K, Rosberg S, Ranke MB. Serum levels of insulin-like growth factor I (IGF-I) and IGF binding protein 3 reflect spontaneous growth hormone secretion J Clin Endocrinol Metab 1993; 76(6): 1610-6. Juul A, Scheike T, Davidsen M, Gyllenborg J, Jørgensen T. Low serum insulin-like growth factor I is associated with increased risk of ischemic heart disease: a population-based case-control study Circulation 2002; 106(8): 939-44. Friedrich N, Haring R, Nauck M, et al. Mortality and serum insulin-like growth factor (IGF)-I and IGF binding protein 3 concentrations J Clin Endocrinol Metab 2009; 94(5): 1732-9. Nieminen P, Löppönen T, Tolonen U, Lanning P, Knip M, Löppönen H. Growth and biochemical markers of growth in children with snoring and obstructive sleep apnea Pediatrics 2002; 109(4): e55. Shah N, Rice T, Tracy D, et al. Sleep and insulin-like growth factors in the Cardiovascular Health Study J Clin Sleep Med 2013; 9(12): 1245-51. Papanas N, Steiropoulos P, Nena E, et al. Predictors of obstructive sleep apnea in males with metabolic syndrome Vasc Health Risk Manag 2010; 6: 281-6. Iber C, Ancoli-Isreal S, Chesson A, Quan SF. The AASM manual for the scoring of sleep and associated events: rules, terminology, and technical specifications. Westchester, IL: American Academy of Sleep Medicine 2007. Lavie L, Kraiczi H, Hefetz A, et al. Plasma vascular endothelial growth factor in sleep apnea syndrome: effects of nasal continuous positive air pressure treatment Am J Respir Crit Care Med 2002; 165(12): 1624-8. Imagawa S, Yamaguchi Y, Higuchi M, et al. Levels of vascular endothelial growth factor are elevated in patients with obstructive sleep apnea--hypopnea syndrome Blood 2001; 98(4): 1255-7. Kuroki M, Voest EE, Amano S, et al. Reactive oxygen intermediates increase vascular endothelial growth factor expression in vitro and in vivo. J Clin Invest 1996; 98(7): 1667-75. Matsuura A, Yamochi W, Hirata K, Kawashima S, Yokoyama M. Stimulatory interaction between vascular endothelial growth factor and endothelin-1 on each gene expression Hypertension 1998; 32(1): 89-95. Schulz R, Schmidt D, Blum A, et al. Decreased plasma levels of nitric oxide derivatives in obstructive sleep apnoea: response to CPAP therapy Thorax 2000; 55(12): 1046-51. Teramoto S, Kume H, Yamamoto H, et al. Effects of oxygen administration on the circulating vascular endothelial growth factor (VEGF) levels in patients with obstructive sleep apnea syndrome Intern Med 2003; 42(8): 681-5. Fujisaki K, Mitsuyama K, Toyonaga A, Matsuo K, Tanikawa K. Circulating vascular endothelial growth factor in patients with colorectal cancer Am J Gastroenterol 1998; 93(2): 249-52. Bondestam J, Salven P, Jääskela-Saari H, et al. Major surgery increases serum levels of vascular endothelial growth factor only temporarily Am J Surg 2000; 179(1): 57-9. Phillips CL, Yang Q, Williams A, et al. The effect of short-term withdrawal from continuous positive airway pressure therapy on sympathetic activity and markers of vascular inflammation in subjects with obstructive sleep apnoea J Sleep Res 2007; 16(2): 217-25. Steiropoulos P, Papanas N, Nena E, et al. Markers of glycemic control and insulin resistance in non-diabetic patients with Obstructive Sleep Apnea Hypopnea Syndrome: does adherence to CPAP treatment improve glycemic control? Sleep Med 2009; 10(8): 887-91. Webb NJ, Bottomley MJ, Watson CJ, Brenchley PE. Vascular endothelial growth factor (VEGF) is released from platelets during blood clotting: implications for measurement of circulating VEGF levels in clinical disease Clin Sci 1998; 94(4): 395-404. Gozal D, Lipton AJ, Jones KL. Circulating vascular endothelial growth factor levels in patients with obstructive sleep apnea Sleep 2002; 25(1): 59-65. Bin-Jaliah I, Ammar HI, Mikhailidis DP, et al. Cardiac adaptive responses after hypoxia in an experimental model Angiology 2010; 61(2): 145-56. Paraskevas KI, Mikhailidis DP. Angiogenesis: a promising treatment option for peripheral arterial disease Curr Vasc Pharmacol 2008; 6(2): 78-80. Ostberg JE, Damjanovic T, Dimkovic N, Byrne D, Mikhailidis DP, Prelevic GM. Effect of tibolone on markers of cardiovascular disease risk in postmenopausal women undergoing hemodialysis: a pilot study Fertil Steril 2004; 81(6): 1624-31. Nena E, Papanas N, Steiropoulos P, et al. Mean Platelet Volume and Platelet Distribution Width in non-diabetic subjects with obstructive sleep apnoea syndrome: new indices of severity? Platelets 2012; 23(6): 447-54. Steiropoulos P, Tsara V, Nena E, et al. 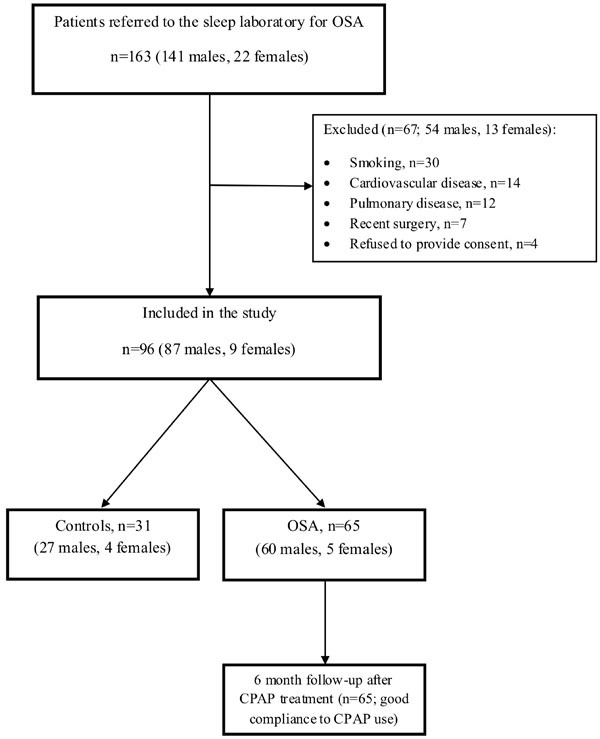 Effect of continuous positive airway pressure treatment on serum cardiovascular risk factors in patients with obstructive sleep apnea-hypopnea syndrome Chest 2007; 132(3): 843-51.